• Digital Asset Management, which will be held in Ostend, Belgium, between 13-17 May 2013. We therefore invite you to share this information amongst potential interested candidates in your country. The courses’ description, topics covered, learning outcomes and prerequisites are available on the leaflet attached and also at www.oceanteacher.org and www.iode.org. Interested candidates can register for the course by following the instructions described at OceanTeacher Academy website, under Registration. Co-sponsorship is an asset for selection. Complete applications should be sent by e-mail directly to the OceanTeacher Academy Training Coordinator within the deadline (15 February 2013). Below is a message from long-time IAMSLIC member, Jan Heckman. We want to thank Jan for all of his efforts in IAMSLIC, including hosting the 29th conference in Mystic, Connecticut and his active involvement in the resource sharing committee. We hope he will continue to participate in IAMSLIC activities and wish him all the best in his retirement. 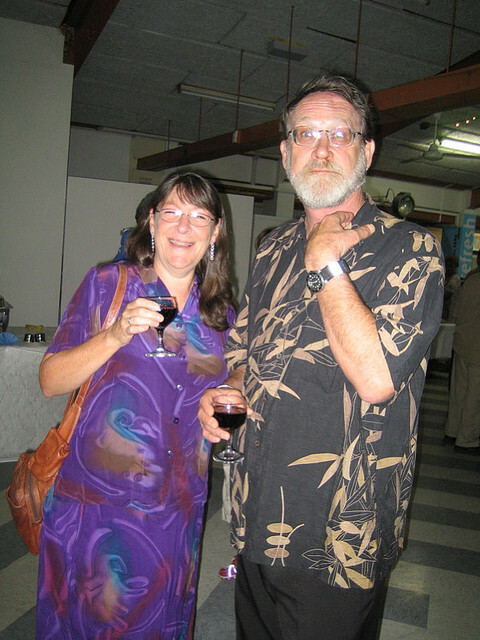 Unfortunately, we don’t have a picture of Jan dropping into the pond in Fiji (as he mentions in his letter) but here he is with Mary at the banquet. I am retiring as of Feb.1 2013. No health issues just a life decision. I have appreciated my membership in IAMSLIC so much that it represents some of the high points of my career. There has always been some satisfaction from helping UConn patrons, an abiding feeling of helping folks navigate the in’s and out’s of information access. There are other local library efforts that I’m proud of but will spare you the details. Being a member of IAMSLIC and being able to contribute will always be something I can reflect upon as positive. IAMSLIC always took the high ground and knew support of its members was very important. Always amazed at how fast and how many times members replied with ILL articles (usually needed ASAP, under pressure from patrons). Should make OCLC a little jealous. Everybody made me look good, or I was able to help them, all good, a team effort. Loved the conferences, made all my colleagues somewhat jealous, loved the jokes, the adventures (rope drop into pond in Fiji a highlight) also the boat trip back from snorkeling in Fiji, more praying going on then than at all IAMSLIC conferences combined I suspect. Met so many different and interesting folks from around the world. Saw cultures and countries from a different perspective than a tourist. Had the chance to host a conference and even though I lost my voice, heard it went well. All that extra lobster at the banquet not planned, but in the end because of health department rules, I think almost all the lobster you can eat is a treat. I will always cherish my time with IAMSLIC. One nice story is when Mary and I arrived at Victoria after being married in Alaska (newlyweds) on an inside passage cruise; we were checking in at the desk and some IAMSLIC’ers (you know who you are) came up to congratulate us. This was Mary’s first conference. The clerk overheard the conversation, which I’m sure was somewhat loud and she took our key back. Then proceeded to hand us the penthouse key, you know what that means, PARTY IN THE PENTHOUSE. Check out the following story reporting the estimated $100 million Elsevier has tendered to buy Mendeley. Many of you know about this, but Skidaway will be moving under the University of Georgia, effective this summer. Here is a FAQ with information about the purchase of Knovel by Elsevier. Copyright © 2013 IAMSLIC News & Events. Powered by WordPress and A Dream to Host theme by Art of Blog.